Mark your calendar – there is NO SCHOOL on Friday, February 15 and Monday, February 18. Friday is a DOI PD Day and Monday is Parent-Teacher Conference Day. 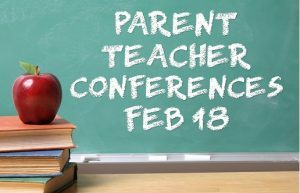 All parents MUST have a conference with their child’s teacher. Please contact your teacher to sign up for an appointment! If you have NOT registered your child for the next school year, we will also have computers available for use on BOTH days to help you register!